When I was a little girl I had a Barbie house. My brother, Jared, would take his Teenage Mutant Ninja Turtles and attack my Barbie house. 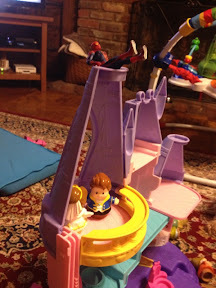 They rode Barbie's horse and he tied ropes to them to repel over her house. Flash forward to today. 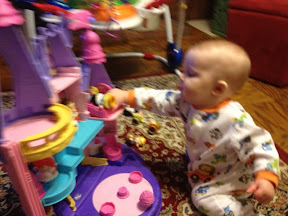 Scarlett was playing with her Little People Disney Princess Palace. 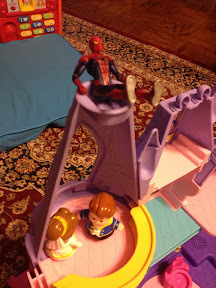 Yep, Spider-Man was there to protect the castle. Talk about déjà vu!